The awarding rites for the UAAP Season 75 Basketball Awards were held earlier this afternoon, October 11, 2012, at the Smart Araneta Coliseum right before Game 2 championship finals, Ateneo vs UST (Ateneo won, 65-62). Valuable Player (MVP) award for the 2nd straight year. Parks dedicated his MVP Award to girlfriend Maan Panganiban, who died of cancer just last January. Maaasahang Player of the Season. Terrence Romeo, who's being linked to comedian Vice Ganda, is a first-time Mythical Five awardee on his 3rd year in the UAAP. He was Rookie of the Year in Season 73. UAAP Season 72, but has never been named as one of the Mythical Five. 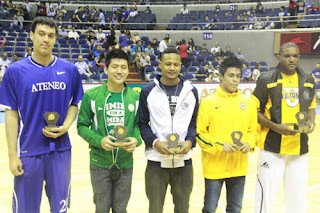 It was also officially announced that the National University (NU) Bulldogs are UAAP Season 75 2nd Runner Up (3rd Place).